Image caption Thames Valley Police said it was treating the death as "unexplained"
A woman whose death is currently being treating as "unexplained" by police has been named locally as Ella Parker. Ms Parker, who is said to have been pregnant and in her 20s, was found dead at her home in New Bradwell, Milton Keynes. 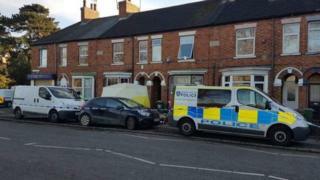 Officers were called to reports that a woman has died at a property in Newport Road at about 14:40 GMT on Thursday. Thames Valley Police has sealed off the mid-terrace house while investigations continue.